An oft bandied around paradox about time travel is the 'Grandfather paradox'. This questions the effects of a time traveller going back in time and killing their Grandfather. Headaches then begin to form whilst trying to figure out how this could happen if the protagonist was, in theory, never born due to their Grandfather's untimely demise. The Flipside of Dominick Hide eschews this and, instead, looks at the great-great-great-Grandmother paradox. This curious postulation features a time traveller going back in time to kick-start his own lineage with their great-great-great-Grandmother. Child's play for any theoretical physicist. The Flipside of Dominik Hide was a 90 minute sci fi drama broadcast on BBC1 on 9th December 1980 at 9.35pm. Part of the Play For Today series, the show was cooked up by Alan Gibson and Jeremy Paul - the blueprints of the show being inspired by the Alan Gibson's fascination with flying saucers in the 1950s. A fresh faced Peter Firth took on the mantle of Dominick with the delectably beautiful Caroline Langrishe playing Jane. 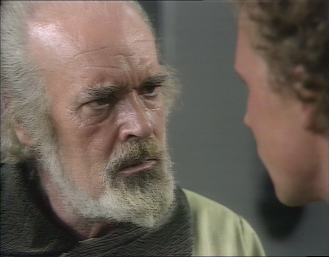 The great Patrick Magee featured in a supporting role as Caleb. Filming for the play started on 10th May 1980 and wrapped on 4th June 1980. In 2130, time travel is possible and any period before the Time Barrier was broken is known as the 'flipside'. This has led to the employment of time travellers whose mission is to travel back to the flipside and observe the mechanics of past societies. Dominick Hide has been tasked with observing transport systems in London, 1980. Tracing his family history has led to Dominick discovering that he has a distant ancestor, also called Dominick, living in this same era and location. 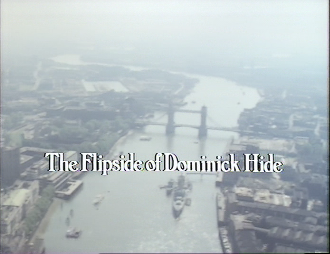 Against strict instructions, Dominick begins to land and search for his great-great-grandfather in London, 1980. Any slight change Dominick makes to the past could buckle the future, but his yearning compels him to continue. Compared to the ordered and steady society of 2130, the London of 1980 is noisy and chaotic. Finding himself in Portobello Market on a particularly busy day, Dominick befriends a small group of pals who vow to help find his distant relative 'Dominick' whilst he takes on the name 'Gilbey' - influenced by a quick glance at a bottle of gin. Whilst the search for 'Dominick' continues, Jane and Dominick become increasingly attracted to each other. A romance fuelled by the difference between their backgrounds and outlooks. Jane eventually falls pregnant with Dominick's child and at this time, Dominick's superior - Caleb Line - reveals that this is the ancestor Dominick has been searching for. Due to a one in a million genetic time mutation, Dominick is his own great-great-great Grandfather - a fact that Caleb has long known and why he has allowed Dominick to land on the flipside. Dominick returns to London, 1980 one more time to set Jane and his son up for life with details on how to win the next week's football pools. Returning to the future, Dominick proceeds to have a child with his 2130 'wife', Ava. The Flipside of Dominick Hide attained viewing figures of 5.3 million and a respectable reaction index of 75 - compared to an average Play For Today score of 59. The Radio Times letter editor claimed that "No other single new BBC tv play in 1980 attracted so much correspondence " - highlighting the public's affection for the show. The success of the show led to a sequel in 1982 entitled Another Flip for Dominick. A DVD containing both plays was released in 2005 accompanied by a very detailed viewing notes booklet. 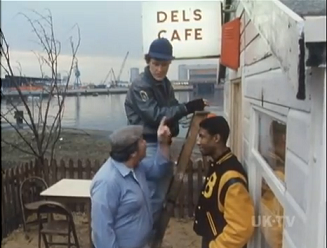 Curious British Telly first discovered Dominick a few months back and was thoroughly charmed by the production. The originality of the core concept is clever and well written - the divides between the two time periods are highlighted subtly, but leave a powerful question about the values of freedom over security. Peter Firth, Caroline Langrishe, Sylvia Coleridge and Patrick Magee all put in terrific performances and capture the essence of their characters perfectly. Some of the acting does fall below par - Pippa Guard came across a little wooden and Timothy Davies was a bit too hammy, but this could also be down to poor characterisation on the writers' part. On the whole, though, there are more hits than misses which is impressive for the era. One other area of the play which impressed was the music. The theme tune being a soulful number entitled You'd Better Believe It Babe by the band Meal Ticket which is echoed throughout. Also present, in the 2130 scenes, are wonderful medieval muzak takes on the Beatles songs: Yesterday and Lucy in the Sky with Diamonds. All in all, this is a fantastic play which comes across with charm and innocence whilst balancing the genres of comedy, sci fi and drama. We thoroughly advise picking up the DVD. 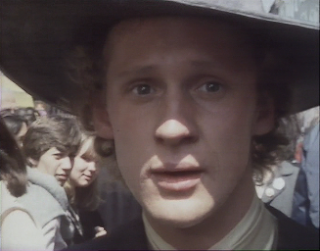 At 26 Peter Firth has come a long way from the time he was ‘the boy in Equus’. After some notable achievements in films and television, and a good deal of foreign travel, he returns to television in Tuesday’s play as a very different sort of traveller – one who specialises in time-warp. He tells Benedict Nightingale why this part particularly appeals to him. What Peter Firth ruefully calls his ‘damaged-cherub face’ was looking strangely phosphorescent when we met at his imposing pad in London W9. Perhaps it was a natural charisma, perhaps a blend of exhilaration and exhaustion, the result of the arrival of a son and heir within the past week. The birth had occurred at home, in defiance of medical scruple, and had brought with it a still unresolved problem. What was the ‘small person’, as he’s still known, to be called? Up the stairs, puffing and contentedly grunting in his mother’s arms, went Timothy, Tristram or Tyrone; and Peter ambled through the house, into the big communal garden through which Nicholas, Nigel or Norbert will one day no doubt make his way to school. That is not a prospect that altogether pleases his father. He is a warm, enthusiastic, outgoing young man; but he cannot speak about his education without resentment. Understandably so. He spent his schooldays in the D stream of a large comprehensive, never was encouraged to read literature or even taught to punctuate properly, and left with no qualifications whatever. That was in Bradford, where Peter’s parent ran a pub in a rough, rowdy neighbourhood. His main occupations seem to have been hanging around on street corners and, just occasionally, getting into trouble with the police and putting in an appearance at juvenile court. But a girl he fancied went to drama classes and one Saturday he followed her there, arriving late and having to hammer on the door. If no one had answered he probably would have mooched off, never to return. As it was, the door opened, he was allowed in and someone even offered him a ‘scholarship’, meaning the two pounds ten shillings course fee he didn’t have. ‘Luck, chance, fortune, the line is this thin,’ says Peter, indicating with thumb and forefinger the tiny gap between success and disaster in his life. The point was re-emphasised when Yorkshire TV came to the drama class recruiting schoolboy walk ons: it was ‘you, you and you’, and he was one of the three. From that came a part in a serial called The Flaxton Boys, and from that a leading part in another – Here Comes the Double-Deckers. At age 15 Peter was in London, beginning to lose his thick Yorkshire accent, and being paid for what he found he liked best: acting. He never went formally to drama school, and doesn’t regret the omission, because he feels there’s no substitute for ‘the real thing’. The real thing was St Francis’s youngest disciple in the movie Brother Sun, Sister Moon. It was also the boy with an overwhelming and finally destructive passion for horses in Peter Shaffer’s play, Equus. He recreated the part in New York, and then in a film version, and found himself internationally acclaimed at the age of 20. It wasn’t an experience he altogether liked. For one thing, he found it difficult to appear on chat shows, smile on demand at press photographers, go lobbying for an Oscar in Hollywood, and do all the other things expected of showbiz celebrities in America. For another, ten months on Broadway proved too long. If Peter had pursued success more relentlessly, he might not now be mainly remembered as ‘the boy in Equus’ and, on occasions be obliged to audition for roles which would once have been thrust upon him. But he preferred to go his own way, rejecting tempting offers, indulging his enthusiasm for travel (‘one way of making up for the education I never had’), and enjoying what he wryly calls the decadent, leisured life in New York City. There were notable achievements over the years – among them Dorian Gray in a television adaptation of the Oscar Wilde novel, the title part in Tony Richardson’s movie, Joseph Andrews – but there’s no doubt his career was becalmed when Roman Polanski lured him back to Europe from America to play Angel Clare in Hardy’s Tess of the d’Urbervilles. This movie, already a considerable success on the continent, arrives in Britain next January. Meanwhile, the important even in Peter’s professional life is his return to British Television in The Flipside of Dom Hide, in which he plays a prim young pilot who time warps his flying saucer from the future to the London on 1980. The naïve and confused attempts of its time travelling Candide to come to terms with our world give a strong comic slant to the play; and that, too, appealed to Peter when he first read the script. Peter would like to return to the stage, provided the play doesn’t run too long; but it’s clear his heart belongs to the camera. "That's how it's got to be if you want prospects. Irons in the fire, bread on the water, birds in the bush. Otherwise life is just waiting for the next giro." And so goes Jimmy Pince's philosophy on escaping the dole queue in the first episode of Channel 4's comedy drama Prospects from 1986. It's a fair summary of what will follow over the next 12 episodes starring Gary Olsen as Jimmy 'Pincey' Pince and Brian Bovell as Billy Pearson. Yes, rest assured that there will be ducking and diving from a couple of Cockney chancers trying to hit the big time. Sound familiar? God bless Hooky Street? Nice little earner? By the mid 1980s, the British viewing public were crying out for socioeconomic studies of the Thames bathing beast that is the Cockney. Only Fools and Horses and Minder were fighting to be crowned king of the wheeler dealers and the recurrent angst of Eastenders was being christened within the sound of Bow Bells. So, why shouldn't Channel 4 have a stab too? 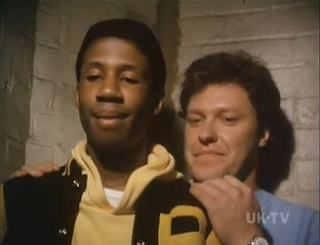 Prospects was produced by Euston Films on behalf of Thames Television - the same setup that was behind Minder. This, of course, was back in the days when a large chunk of Channel 4's financial backing came from ITV and its various regional guises. Advertisement space and airtime was up for grabs and, thus, Prospects began airing on Channel 4's Wednesday 9pm slot. Alan Janes - whose previous work included Minder, Grange Hill and Z Cars - wrote all 12 episodes and the series was produced by Greg Smith - producer of the bawdy Confessions of a... series and co-producer of long running West End musical Buddy. The theme tune was composed and sung by Ray Dorset of perennial summer soundtrackers, Mungo Jerry. Tying in with the series, there was the almost obligatory release of books based on the show by Futura Publications. Episodes usually centered around Pincey and Billy establishing a business in the designated 'enterprise zone' of the Isle of Dogs. Pincey takes the lead role in devising the week's hairbrained scheme - with dubious ethical overtones - and Billy, at first, acts pessimistic, but the promise of pound notes soon twists his arm. Business starts swiftly, but the duo's incompetency would usually lead to insolvency - much like Del Boy, though, they would occasionally come up smelling of roses. Filming took place during a time of great change for London, the Docklands were being redeveloped and this creates an interesting visual mix of building sites and decaying architecture in the background. Prospects fared well on Channel 4 and was rewarded with a repeat slot on ITV. Things looked promising for a second series - rumoured to feature Pincey and Billy running a mini cab firm - but, sadly, this never transpired. Copyright issues have been put forward as a reason for the series coming to an end, but these haven't been substantiated. Currently, the only way to view the series is via a few episodes on YouTube or to pick up an illicit DVD which uses the UKTV repeats of the series. This DVD can be found online at various sites or occasionally on Ebay. March 2013 finally saw the show officially released on DVD. Curious British Telly views Prospects as a missed opportunity. One aspect that frustrated is the bloating of episodes with filler material to make up the running time. 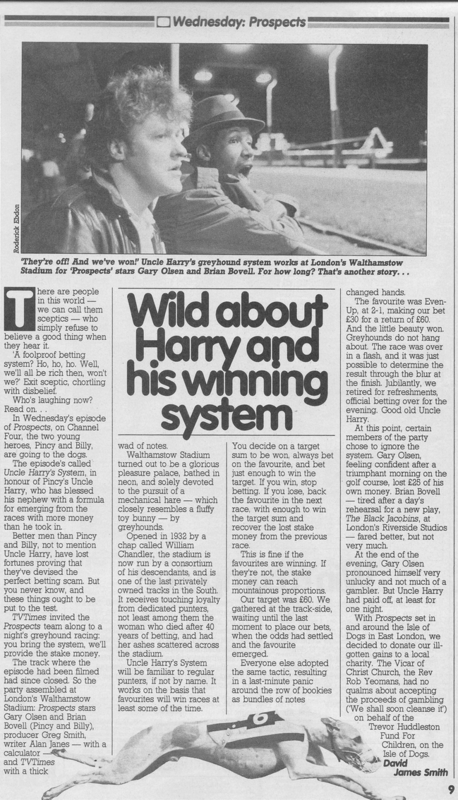 Take 'Uncle Harry's System', the main plot itself isn't particularly deep, so to make up the duration, a subplot featuring Billy going to court for GBH is stapled on. Unfortunately, this is an uneventful affair and resolved half way through the episode without any bearing on the main plot. It's disappointing as it's a missed opportunity for more rounded story telling. The character of Billy is also a bugbear as he seems to have suffered from poor character development. Most of the plots are driven by Pincey with Billy doing little more than following round as his lackey, voicing only the occasional disapproval. Nonetheless, there are also positives to the show. Pincey's character is a highlight and Gary Olsen brings plenty of roguish charm to the role. The camerawork is surprisingly good for the time - instead of just pointing the camera and shooting, there has been a real effort to give the show some visual appeal. It's not TV cinematography on the scale of Sherlock, but it certainly beats Crossroads. Praise can also be reserved for Prospects taking a swipe at Margaret Thatcher's policies of the time - sure, Pincey and Billy embrace the concept of free enterprise, but the hardship of unemployment leads to operating below the law. Despite not being a rollicking laugh riot, there's enough humour to give the show a breezy, laddish charm and, taking the better plots into account, one well worth a visit. 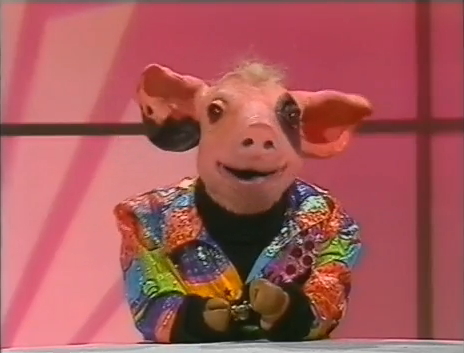 The theme tune comes to an end, a star covered door slides open and out bounds a talking pig dressed in a jacket so garish that even Jonathan Ross would think twice before donning it. The pig then proceeds to take to the pretty well designed chat show set where he begins to interview a giant bird wearing some natty 90s threads. No, this blogger hasn't been snorting mescaline through old issues of the TV Times, this was The Pig Attraction! 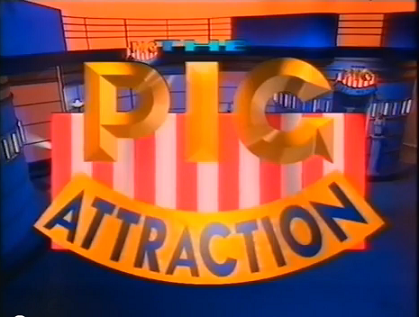 The Pig Attraction aired in 1993 on ITV during the CITV slot and is a difficult beast to define. Its main subject matter wasn't the lesser explored world of romance between man and pig, but, thankfully, puppets. The show centered upon the art of puppetry through a number of different sections. Billie the Pig fronted the show where he mostly interviewed TV puppets from the past. Billie was also involved in the backstage sections which recalled the chaotic nature of The Muppet Show. Billie was backed up by the puppeteer Simon Buckley - with a ridiculously long list of puppet credits - who would take to the road to visit puppet theaters and discuss their craft. There was only one series produced by HTV consisting of ten episodes and no repeats ever aired. It was the epitome of a curious show and a brave move by ITV to aim something so niche at children. Another series would have been welcomed by myself, but I can't recall a huge buzz in the playground about the show. Other contemporary documentary programmes such as How 2 and It'll Never Work seemed to capture the interest of my sugar addled peers more. An interesting note is that, perhaps more than anything, this show ignited my interest in TVs murky and alluring past. For the first time in my short life, I began to think back to TV shows that I could only remember fleeting fragments of. The Internet was still several years away from becoming a mainstream utility, so The Pig Attraction was a rare resource on the history of Children's TV. I recently contacted Simon Buckley to see if he would be willing to answer a few questions about the show and he kindly accepted - Curious British Telly's first interview! CBT: Hello, Simon! Many thanks for taking part in this interview for Curious British Telly. So, how the devil are you? Simon: Hi, I’m well thanks - just been discussing the logistics for another batch of Churchill Insurance commercials which is one of my current on-going projects. A quick glance at your website reveals that you've had a long career in the puppetry game and worked with some iconic British puppets. How exactly did your career start? Was it performing sock puppetry for family members or something more intriguing? Haha! Not socks but gloves! Well, glove puppets. It all began with the gift of Sooty and Sweep glove puppets from my grandparents when I was about four, but things really got going when (after a nicely worded letter to Santa!) I got a string puppet wizard for Christmas at the age of eight. It was a ‘Pelham Puppet’ part of a large range of quite nicely made puppets that were sold in ‘posh’ toy shops in the 60’s and 70’s and I quickly saved up my pocket money to buy dozens of different characters over the following years. My parents and their friends patiently watched my latest ‘performance’ as I demonstrated each new puppet in some, probably tedious, show! I was asked by a girl in my class to do a show at her birthday party and so aged 9, and charging £1 my professional career began! In the year I turned 16 I did just over a hundred shows at birthday parties and the like, and was charging a bit more than £1! I've always found The Pig Attraction very interesting as it was so varied and difficult to pigeonhole into one genre. It was part documentary, part chat show and part show within a show which kept it fresh - essential for keeping the attention of children. Could you tell us a bit more about the show's origins and how you came to be involved? For six years I performed a character on Saturday morning ITV called Nobby the Sheep. Nobby’s first show was called Ghost Train and it toured around the country with a different episode each week being produced by a different TV region (we had lots of ITV companies in those days) In Bristol and Cardiff the shows were produced by HTV and HTV West where Peter Murphy was the producer. He had a passion for puppets and innovative TV and had produced the hugely successful Rolf’s Cartoon Club, in which the legendary Rolf-Tie-my-kangaroo-down-sport-Harris demonstrated the art of animation and cartooning in between clips of classic cartoons. Peter wanted to do something similar, but with puppets. About the same time, having met me through Nobby the Sheep, Peter engaged me to work a puppet pig for an environmental series with Bill Oddie called Ask Oddie, and so the idea evolved to make the format of the puppet series a chat show with Billie the Pig as it’s host and with my knowledge and experience at it’s heart. On camera, you were visible as a presenter for The Pig Attraction and also hidden as one of the puppeteers. I believe that, off camera, you had a role as consultant for the show. What exactly did this entail? The show’s format was developed entirely by Peter Murphy and Peter Curtis at HTV. But I believe it’s fair to say that about 90% of the content came from me. I was really keen to use this as a showcase for the vast range of puppetry styles and techniques many of which were not used on television and inspire children with this rich and wonderful artform. My exact title changed so many times, but basically I basically provided everything from many of the contacts with puppeteers and puppet companies, to an understanding of the subject in hand as well as the set dressing for the puppet workshop and devised the simple ‘make and do’ elements of the show. I had more pies to have fingers in than I actually had fingers! Billie the Pig was the host of the show firing out wisecracks here and there as he tried to hold the show together. He's always reminded me of a porcine Bob Mills, but I wondered if you could explain the influences behind him. Billie was more inspired by Ben Elton (as he was in the late 80’s) I think, than anyone else. Part Kermit - always stressing backstage about the acts that hadn’t turned up, and maybe part cheesy gameshow host, with his penchant for mock Versace glittery jackets! How smoothly did the production of the show go? I know from experience of filming with humans that production can be a strenuos task. How does this differ when puppets are thrown into the mix? Oh it all went a breeze darling and there were absolutely no hiccups or tantrums! Haha! There were a few, but not too many! It was great that most of the puppeteers were friends of mine so they were really keen to support me, but a few of them I didn’t know and their sole interest was to make their puppet appear to be the ‘best’ on the show. Particularly those who were not used to working as a team (as those of us who worked on say Spitting Image did) came with rather larger egos! The logistics for the set were tricky too, in the end it looked great but the variety of sizes of puppet and different operating methods did set a few unique challenges that you don’t face if you’re filming Eastenders! I also wore too many ‘hats’ in the show and so the filming days were some of the hardest I’ve experienced in my 27 years of TV. Most episodes featured yourself travelling to meet various puppeteers and theatre groups to chat about the mechanics of puppetry. You always seemed genuinely enthused about discussing this art, so is it fair to say it was a dream job? I was passionate about this show, and the show we started to make was a dream come true for me. It took a few turns that I didn’t really like (too many C list puppets plugging their own shows, rather than contributing anything really interesting or funny) and some of the original concept got lost, but even today people thank me for pieces that I filmed on the Puppet Barge or The Harlequin Puppet Theatre in North Wales (Britain’s First Permanent Puppet Theatre built in 1958) as they provide a really valuable and quite rare record of that kind of puppetry. I was also thrilled to get such a great series of interviews with Brian Henson, son of Jim, and I am sure that it was my genuine inside knowledge that enabled him to be very open with me and share so much with the audience, beyond what we had been told he would be prepared to do. Too often when someone interviews a puppeteer they ask the same overly simplistic questions like “do you get the strings tangled?”. Yaaaaaaawn!!! Thankfully the fact that I knew my subject helped to make up for the fact that I really wasn’t great on camera... I think I was more wooden than any of the puppets! And boy did I wear some shocking clothes. There was only the one series of The Pig Attraction produced, but were plans for a second series ever mooted? Did the team feel as though they had accomplished everything they had set out to do or was there further ground to cover? I can’t pretend the show was a massive hit with the viewers, who didn’t quite know what it was (going back to your earlier question really!). An Exec at the BBC said to me afterwards “I wish we’d made it, we would have refined the idea and got you a second series”. I think that’s true, but with ITV being more ratings conscious (because of the advertising) it was a case of if it’s not a clear hit, let’s ditch it and try something else. I did think there was more of the world of puppets to show, but we had almost exhausted the inter- puppet chat show format with Billie I think. Finally, what are your fondest memories of working on the show? Lots. I loved working with the beautiful Jan and Vlasta Dalibor, the elderly and original creators of Pinky and Perky - characters I had loved as a child. They were the most charming and delightful couple to work with. Filming at the Harlequin was a particular joy, as Eric Bramall the theatre’s founder had encouraged me so much as a teenage puppeteer, and it was great to be able to have him as a guest on my show, hopefully proving that his encouragement had paid off. But what was most striking was the way that the crew fell in love with so many puppet characters, or appreciated the skill involved in making and performing puppets. It was, and remains, the ability of these funny little characters to make us believe they’re alive- if only for a moment- that never ceases to make me smile. Simon, it's been an absolute pleasure chatting to you and finding out a bit more about The Pig Attraction! 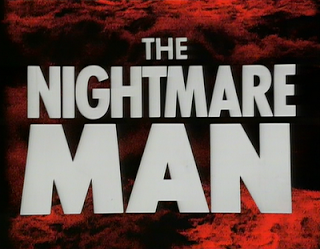 The latest show that Curious British Telly will be cocking its eye towards is the BBC's 1981 production of The Nightmare Man. 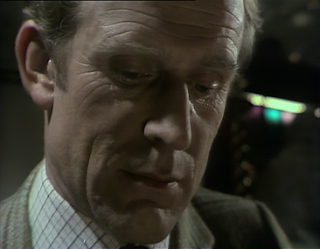 Based upon the 1978 novel Child of the Vodyanoi by David Wiltshire, the TV version was adapted by the mercurial Robert Holmes of Dr Who fame and directed by Douglas Camfield. The serial was set over four episodes and broadcast between 01/05/1981 - 22/05/1981 at 8.20pm on BBC1. The Nightmare Man takes place upon the remote Scottish island of Inverdee where the body count is rising as a rasping psychopath stalks the peaceful, grassy knolls. Lines of communication are jammed as an enveloping fog descends upon the isle and the likelihood of outside help begins to diminish. Heading the investigating force is Inspector Inskip who - through mouthfuls of whiskey and cigarettes - concedes that the murders are more brutal that anything he ever saw in Glasgow. Aiding the police force is Michael Gaffikin, an English dentist who is trying to win the heart of local chemist, Fiona Patterson. Ever present in the background, is the holidaying Colonel Howard who is overly keen to enquire and offer help. Robert Holmes is revered amongst Doctor Who fans for his charmingly idiosyncratic scripts during the classic era of the program. One of his early creations - the Autons - were even chosen to kickstart the new era of Who in 2005, an impressive 35 years after their first appearance. If anyone is unfamiliar with Holmes' aptitude with a script then just check out Genesis of the Daleks - featuring the infamous "Do I have the right?" speech. Therefore, BBC producer Ron Craddock had little doubt that The Nightmare Man would be in safe hands when approaching Holmes. There are little similarities between this show and Holmes' Doctor Who - the lighthearted charm of Doctor Who is replaced by a much more mature and serious tone. 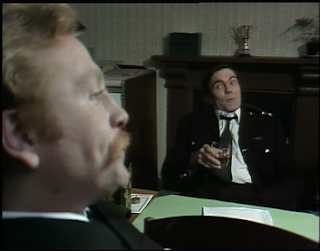 The only similarities are the perilous cliffhangers and the occasional workings of a double act between Inspector Inskip and Sergeant Carch. In the best tradition of suspense, the killer in The Nightmare Man remains mostly hidden until the last episode. Up until then, the viewer is only thrown a handful of brief and inconspicuous glimpses of the killer - giving little clues to who or what is terrorising the islanders. It's a decent enough trick, but the eventual reveal in episode 4 is a little disappointing and one suspects the show - as with most sci fi of the time - was not given the largest of budgets. 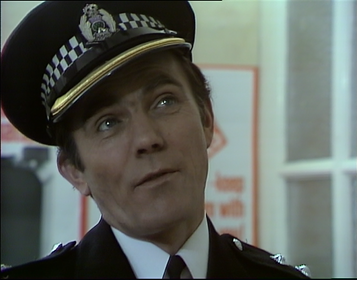 The acting is passable and no worse than other similar shows of the era, but the only performance that I felt stood out was the calm, but determined Inspector Inskip portrayed by Maurice Roëves - later reunited with Robert Holmes in the Doctor Who serial Caves of Androzani. The first episode attracted an audience of 7.4 million viewers and then averaged 6 million views for the following episodes. In the days where there were just four channels on offer, these were not the types of ratings considered huge , but respectable nonetheless. The public reaction appeared to be positive with a number of comments making the national press and the show was later sold to several foreign climes. Despite this, the show would never be repeated again on British TV. The show became commercially available for the first time in 2005 with the DVD release. It comes with an accompanying booklet which details somewhat exhaustive production details for any sycophants.